Get comfortable using Amplicare – find what you are looking for with ease. Go to Patients to view an All Patients report. From here you can sort and filter patients to your liking. Products - the meat and potatoes! Amplicare Match (iMedicare): Newly Eligible report, Dual Eligible report, Open Enrollment reports, Formulary Lookup. Amplicare Impact: Adherence report, Gap Therapy: Statin, Gap Therapy, ACE/ARB. Amplicare Restore: Nutrient Depletion, Naloxone Intervention, OTC Birthday Pormo, Flu Vaccination. 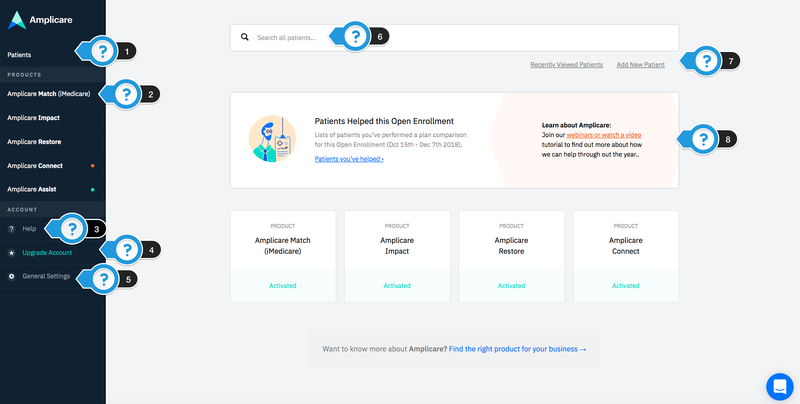 Amplicare Connect: Automated Campaigns, Custom Campaigns. Amplicare Assist (if applicable). Help provides you with training and additional resources that will help you get the most value out of Amplicare. Upgrade Account will provide you with information on the Amplicare products you are not yet subscribed to. General Settings gives you access to Settings to edit account info, letter templates, voice recordings, and Assist customizations. If you're logged in with owner credentials you can access the Admin Panel to view usage stats. Use the search bar to find a specific patient that fills at your pharmacy. View the last 10 patients you visited in Amplicare for quick reference and manually add new patients that have not filled at your pharmacy before. Now that Open Enrollment is over, check out the Patients Helped Report to view all of the patients you worked with this Open Enrollment! Don't forget to use the blue circle on the bottom right of your screen to chat our support team if you have any questions! Now that you're an expert using Amplicare, read this article to learn about best practices for Open Enrollment!